Laura’s latest book is touted by many as her best. 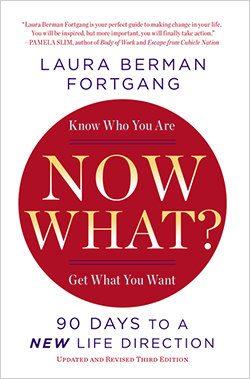 It walks you through the 12-step, 90-day process Laura uses with clients to help them answer what’s next for their life. If you are considering doing something else with your life and are asking ‘what should I do with my life?” this book is for you. Let Laura help you figure out what to do next and how to get there. It is geared for the totally lost, the somewhat decided and those ready to change alike. More information / Order now! Now What? – Now on Audio! Now What?® Coaching Team as they share insights from 10+ Years of supporting clients to find career clarity & life direction so that you can make the changes YOU’VE been dreaming about.